This entry was posted in Awards and tagged Chicon 7, Northern Illinois University, Peggy Rae Sapienza, Special Collections, Steven H. Silver by Mike Glyer. Bookmark the permalink. Why did Chicon decide to give money to Northern Illinois University a an endowment? What that means is the university will keep the money and spend a couple of thousand a year–if they spend anything–because of the interest. Why wasn’t the money given as a direct grant to the school on condition that if the university failed to spend the funds on books within a particular term limit? Because ChiCon 7 didn’t want to set it up that way…? Why would one want to do it that way? An endowment means the university will be able to maintain a collection. If you buy books for a library (or give them money specifying that they buy books with it), they’ll eventually end up having to sell the books because they won’t have the money it takes to maintain them. Many people donate their book collections to libraries, only to see the libraries sell off the collections for want of funds to maintain them. An endowment is the gift that keeps on giving. As Kevin said, it’s about making sure the money is available continuously going forward to preserve and expand the collection. The endowment has a trustee on our side of things who is involved in how the endowment money is spent, so I think we have as much control as you were hoping for with a directed grant, we just accept that the money spent in any year will be less than the size of the endowment. It is our goal to work to expand the endowment going forward so there’s more money to spend each year….this donation was just the amount we had available from Chicon 7 and was fortunately sufficient to start an endowment with NIU. Kevin Standlee: You have not seen the monograph I did for the Pope Center called GAMES COLLEGES PLAY, which you can get at the Pope Center website. In it, I discuss, among other things, the games play with universities accepting money for an endowed chair, then saying they don’t have enough money to fully vest the chair and keeping the money in escrow (while drawing substantial fees for maintaining the account). I refer you to the case of Stephen Ambrose’s efforts to endow a chair at the University of Wisconsin history department as exhibit A.
I am fully aware that fans donate their collections to libraries only to have a future director decide the collection isn’t worth keeping. But establishing an endowment means that donors to this collection are surrendering partial or complete control of the money. I want to be sure that this is what fans want to do, as opposed to the better course of giving money every year which is completely under the control of the donor. That doesn’t appear to be the case here. I’d like to provide some additional clarification as the Curator at NIU responsible for both the collection and the Sapienza endowment. Books accepted into our collections cannot be sold off, because they become State of Illinois property. There are a ton of regulations that make sales difficult even if I wanted to do it, which I don’t. An endowment like this provides continuous funding for the collection. It literally forces the person in charge (in this case, me) to continuously add to the collection or promote it or serve it in some specific way (we could use it towards paying for professional conservation of fragile items, for instance). I report to the NIU foundation annually on what has been done with the funds, and if they are not spent, I am required to explain why. That report is also directly furnished to the endowment trustees. I am absolutely thrilled to have this endowment in place to support our work of preserving the papers of over 75 SFF authors, the official archives of SFWA, thousands of books and magazines, and materials from Chicago area fandom. We have been building this collection for a decade. I am more than happy to answer additional questions, with the caveat that I speak for myself, and relay NIU’s policies, not those of any other university. I don’t want to press this point, but I know a great deal about the problems of endowed chairs, and I want donors to know that most of the money they will donate will probably end up in an escrow account and not be directly used to fund or preserve the collection. The Foundation invests all of the principal. The interest that is generated from the investment varies from year to year, but no more than the equivalent of 4% (if I remember correctly) of the total value of the endowment (from the interest income) is ever furnished to us to spend on the collection. In real dollars, what that means is that a $25000 endowment will typically kick out $800-1000 per annum for its intended purpose, which, in this case, is to purchase materials for the collection, do preservation, promote the collection, etc. A higher principal will create a higher expendable income, of course. At no point do I have direct access to the principal. I am told that I have X dollars to spend for the stated purposes of the endowment, and I do so through our established procedures and systems based upon state law and reporting requirements. This endowment is tied to the Science Fiction Collection specifically, not to me personally, or to the position of Curator . It’s not the same kind of endowment as endowing a Chair. None of the funds from this endowment pay for my salary or benefits. In either case, the money is required by the terms of the endowment agreement to be spent on the science fiction collections. In a sense, this endowment will make this collection “curator-proof.” Anyone who takes the curator role or responsibility for stewarding this science fiction collection is required by the terms of the endowment to spend this money, year after year, only on the science fiction collection. It makes the dissolution of the collection very, very difficult indeed, which indeed was part of the goal in setting up the endowment as the Chicon board has elected to do so. I am *very* pleased to have this endowment to help cement the importance of the collection, and to provide for its sustained growth and development. I hope that this clarification allays some of your concerns. Addendum: should the investments have a good year of returns (say the endowment earns 6%), after the expendable income (4%) designated by the Foundation is put forward, any remaining interest income (the additional 2% in this example) is reinvested into this specific fund, to help build the fund over time. Ms. Thomas: Thank you for your candor. My point in asking these questions is that future donors should be aware that 95 percent of their gift will NOT directly aid your collection. It will just sit in a bank account gathering interest. 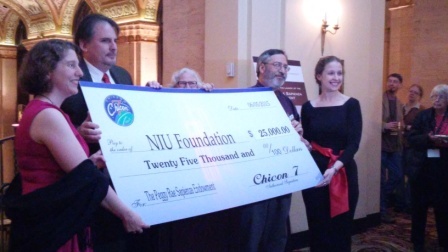 It would have been far better if Chicon had set up a donor-advised fund within the NIU Foundation, with the proviso that the $25,000 and all future gifts would be spent on your collection within five years of a donation. That would put the gift to work NOW instead of being dribbled out over the decades. But they chose to create an endowment. That wasn’t a very good idea. See, then in 5 years there’s no more money and things can go away. In my view, that is ridiculously short sighted and sets everything up for a very poor ending. Fandom has existed for most of a century and I believe it’s likely to exist for just as long going into the future. Over any real time span, an endowment will generate not just more operating funds than the donation…but security for the thing it’s directed towards. This is purposefully why we chose an endowment. Your model results in a threat to the collection at any point where there’s a break in donation…without constant new money, the collection’s existence is put at risk. There are many things that can threaten a collection (as the Eaton demonstrated last year)…lack of funding is one of the one’s that is easier to avoid as long as you have a reasonable view of how endowments work. Dave McCarty: I’ve been studying the problems of perpetual endowments for over 25 years. My book THE GREAT PHILANTHROPISTS AND THE PROBLEM OF ‘DONOR INTENT’ went through three editions. And I have long concluded that the evidence that the wishes of donors are honored for more than 30 years after a donor’s death is vanishingly small. I’m not going to argue this any more–I’ve made my point–but I hope you tell future donors that 95 percent of the funds they will contribute to the Peggy Rae Sapienza endowment will NOT be used to enhance the collection today, but will be put in a trust in the hopes that in 2090 or 2115 the collection will exist and the endowment will contribute to it. Given the lengthy history of foundations ignoring a donor’s wishes, why are you so confident that the NIU Foundation–based at a university library that, by your account, doesn’t really want an sf collection–will honor your agreement after you and Ms. Thomas are no longer around to look after it? If what you were saying was true, then sure, I might tell folks that. I suggest you not hold your breath.